Towards the end of the Second World War, Enrico Piaggio was driven to start up production again by the idea of offering the widest possible market a low-cost product. And, with this idea in mind, the factory at Biella produced a motor-scooter. This prototype, designed by the engineer Renzo Spolti and coded MP5 (Moto Piaggio 5), was christened “Paperino”, that is “Donald Duck”, by the workers. But Enrico Piaggio didn’t like it, and passed the job over to Corradino d’Ascanio to review the project and build something different, more advanced both technically and stylistically. 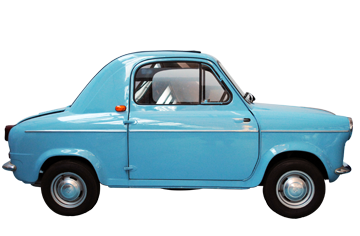 Rather than modify the Paperino, d’Ascanio designed a completely new vehicle which was soon to become the Vespa. 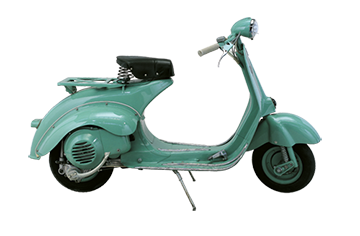 However, before “evolving” into the Vespa, about one hundred Paperinos were produced, which are today highly prized by collectors the world over. 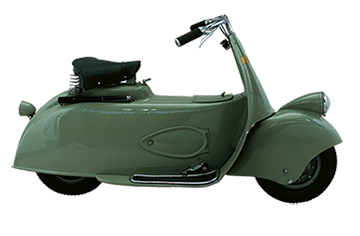 At the end of World War II Enrico Piaggio gave Corradino d’Ascanio the job of designing a simple vehicle tough, economic and elegant. It had to be easily rideable by anybody without dirtying their clothes, and have a seat for a passenger. D’Ascanio, who was not a great lover of motorbikes as such, drew up a completely original vehicle. Digging into his aeronautics background he came up with the idea of a vehicle mounted on a chassis with the gear change on the handlebars. He also put the drive on the rear wheel so creating a highly original wheel-mounted engine grouping. The front suspension arm, looking a bit like an aircrafts landing gear, made changing the wheel much easier. 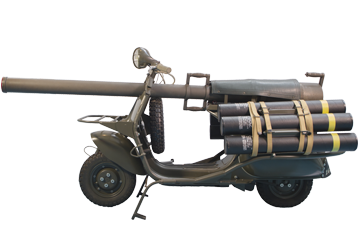 This prototype, the MP6, was still without a name when in September 1945 was presented to Enrico Piaggio, who, exclaimed: “It looks like a wasp [Vespa]!”. 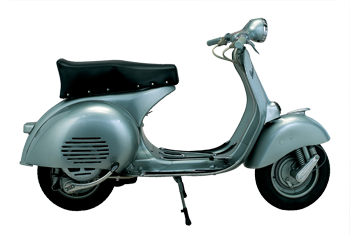 The absence of the engine cooling fan, the brake lever on the left side instead of the right, the horn under the saddle, the footboard’s aluminium laths, and the aeronautical symbol on the front shield are the most important differences between the MP6 and the future versions of the Vespa. The motoleggera utilitaria Vespa, or light motorised runabout, was presented to the public for the first time in April 1946 at the Rome golf club. 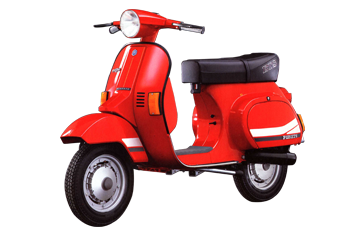 The leg shield sported the new Piaggio logo, which replaced the former aeronautical emblem. The fortnightly magazine “La Moto” dedicated its cover to the Vespa and the new scooter sparked off curiosity, surprise but also a certain scepticism among the public. The first fifty vehicles were produced at Pontedera’s factory at the same time of the official presentation. 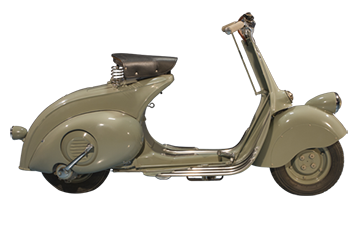 For the first few months the Vespa was marketed by the Lancia dealer network, and a total of 2,484 were produced in its first year of life. And so the adventure of the world’s most famous scooter began. 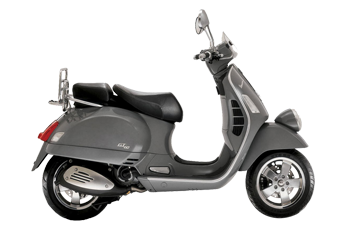 The price of the Vespa 98 was of Lira 55,000 while the “luxury” version was sold at the price of Lira 66,000.
helicoidal spring on the front wheel, elastic with helicoidal spring and hydraulic shock-absorber on the rear wheel. 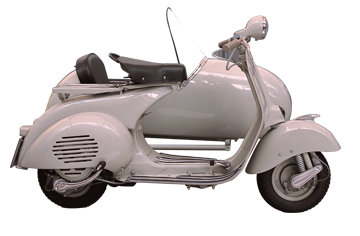 Very similar to the 1948 model, the 1951 Vespa was more comfortable, especially because of the addition of a hydraulic shock absorber to the front wheel. The major difference was the gear change, with soft control cables replacing the earlier push-rod linkage. The fuel-oil mixture tap with its filter and key to open and lock the fuel reserve was particularly useful. From an aesthetical point of view, the rear lamp, round in the earlier models, was now rectangular; the saddle had a new colour and design – it was closed in front to hide the suspension movement. 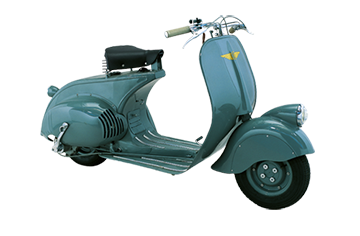 Very popular in those years, the 1951 model was the Vespa on which Audrey Hepburn and Gregori Peck made their romantic escapade in the unforgettable film Roman Holiday. 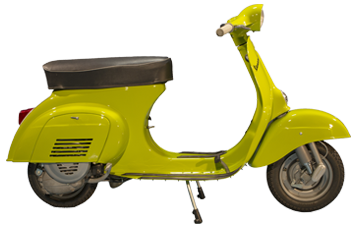 Only 7,000 of this Vespa U were produced, and so today it is among those scooters most sought after by collectors. 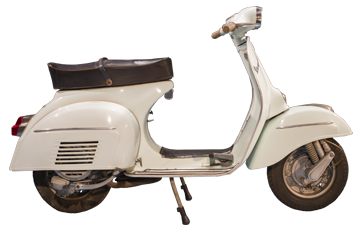 It was launched in 1953 as an “economy” model, the “U” standing for “utility”, and its price to the public of 110,000 lire was intended to offset competition by Lambretta. 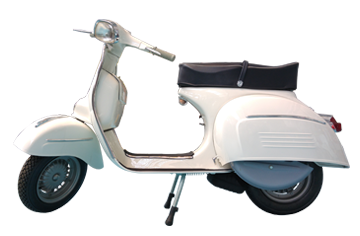 For the first time, a Vespa aimed at the Italian market mounted the headlight on the handlebars rather than on the front mudguard. 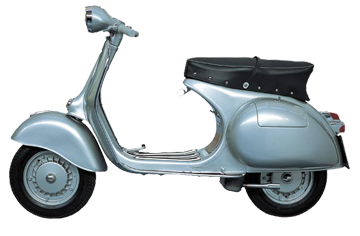 The 125 model of 1953 was the first to have a full right hood rather than a hood open in correspondence with the cooling fan, an innovation that created an aesthetically cleaner, more pleasing line. This was also due to the new “square” engine with bore and stroke of the same dimensions. Power increased, but without affecting fuel consumption, thanks to the new inlet system with cross-current distribution. The decision to enclose it fully in the right hood was taken due to the new dimensions of the engine. For the first time, a 105 mm instead of 95 mm diameter headlamp was mounted. Both the clutch and the gear box (cruciform gear change) were reinforced, and the carburettor increased to 18 mm. The fan cover had a new design and matched the body colour. The central frame section was strengthened. Fuel tank capacity was increased to 6.25 litres. The footrest had 9 rubber strips. 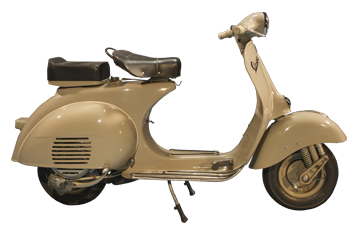 Following on the heels of the Vespa Sei Giorni (6 days), of which only a limited number were produced, the 150 GS was the first standard-produced “sport” version of the Vespa and became a milestone in the history of not just the Vespa but of the motor-scooter in general. 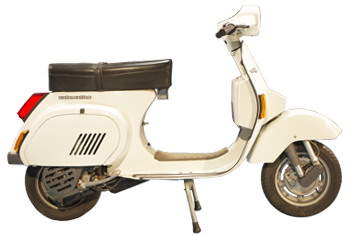 Born from the Piaggio racing team experience, the GS was the first scooter with a 150 cc engine and was highly sporty in concept. It had a direct fuel injection engine generating 8 bhp at 7,500 revs and reached a top speed of 63 mph. 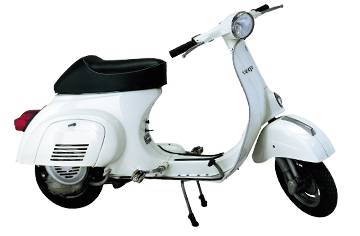 It had a four-speed gearbox, and its long saddle and large 10″ wheels gave the Vespa line a new, aggressive look. The model shown in the Piaggio Museum is a pre-series. Compared to the previous series, the most important aesthetic change was in the handlebars, which now had a fairing, cast in a single die, with the cables passing inside. The speedometer was standard. The headlamp had a chrome-plated bezel. The saddle was dark blue. The “Vespa ” wording on the shield was chrome-plated. The new handlebars gave this model a more elegant and pleasing personality. The line was sleeker, a detail greatly appreciated by the public. 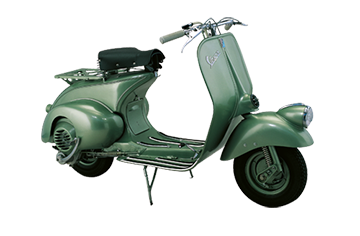 A distinguishing feature of the second Vespa GS series was that the cables passed inside the handlebars. The speedometer was white. The ignition key was flat. The saddle had a new, more rounded shape. The shield had two stainless steel edges. The exhaust was fixed to the cylinder via an aluminium ring instead of a strap. The fuel tank had a cap with locking wing nut. The VS3T version had a low-profile battery that could be placed inside the tool bag. The engine too had a new design – it was smaller, with the transverse strut incorporated into the crankcase. 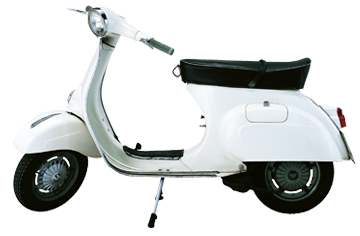 Before the 125, the 150 modified the scooter mechanics by adopting rotating distribution, enabling use of a 2% petrol-oil mixture. The carburettor was housed on the engine casing instead of on the cylinder as in the first 150 GS series. The inlet on the engine casing was regulated at each rotation by the opening and closing of the left crankshaft counterweight. Users appreciated the resulting benefits: smoother power delivery, fewer carbon deposits and lower running costs. Piaggio launches the Vespa 180 Super Sport which has a top speed of 105 km/h, and is therefore recognized as one of the fastest scooters of the time. Its line is squared off and modern, and it is enriched by some components of the GL model (like the trapezoidal headlamp). This model uses the piston port for the last time, which will change to the rotary valve with the later model, the Vespa 180 Rally. 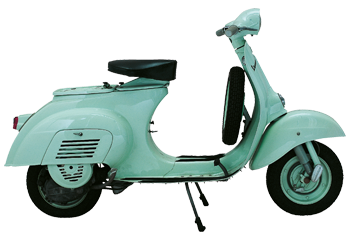 The Vespa 125 Granturismo, whose frame was identical to the Sprint 150, was also very similar to the 125 Super: the main difference was in the wheels, which were 10″. Performance was slightly better due to a higher compression ratio. The headlamp was trapezoidal. The body was becoming more modern (thanks to the new headlamp) and the wheels had a larger diameter: a characteristic particularly appreciated by the target public of sixteen-year-olds. 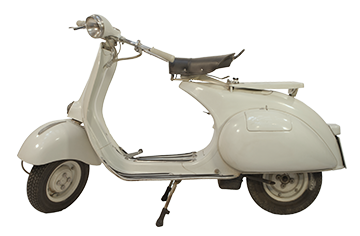 The Super Sprint 90 is no doubt the most stylish Vespa with its unmistakable aggressive design, “its speed, its irresistible spurt and its stirring riding” is produced by Piaggio starting in 1965. Vespa 125 Primavera (“Spring”) met with immediate success. 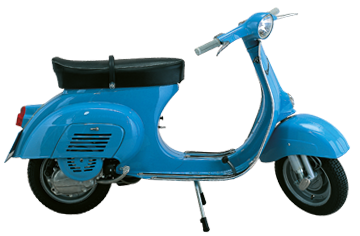 Easy to handle, trim, quick, powerful, are some of the adjectives that describe the Vespa Primavera in the 1960s. The young are the main characters of the spot “Con Vespa si può” (“With Vespa it’s possible”) that addresses teens above 16 who love sport and nature, and do not like to get stuck in the traffic and be late for dates with friends. After the success of the Vespa Super Sport 180, Piaggio puts the new 180cc vehicle on the market with a completely new mechanics and frame, which derive from the Vespa Sprint of 1966, with some aesthetical changes to the handlebar, storage box and saddle. 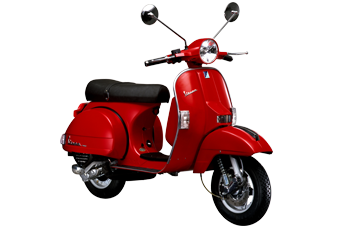 The Vespa Rally 180 is still one of the most functional and best looking vehicles. Its production began in 1968 and ended in 1973, with a total of 26,000 vehicles built. 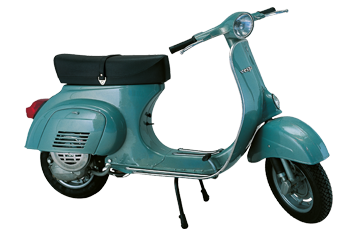 Although this new 50 N model maintained all the characteristics of the model launched in 1963, it had a number of small differences (apart from the new colours): the new hexagonal Piaggio logo appeared on the shield (introduced in 1967) and the Vespa logo was in black. 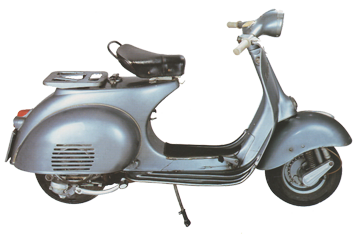 From 1967, the Vespa 50 N was produced with an elongated frame. 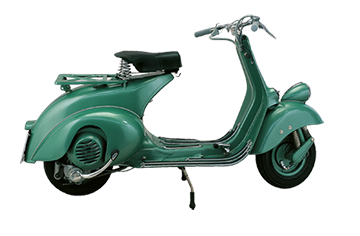 The “R” version of the Vespa 50 was the most economical model in the series, distinguished from the others by its 9″ wheels and front handlebar cowl matching the body colour. The gearbox was three-speed. This 50 was particularly popular among fourteen-year-olds because it seemed to fully satisfy the widespread desire for freedom, in part thanks to its excellent value for money. 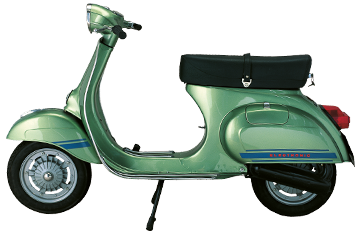 Sold in the years of maximum protest against society, from 1969, the Vespa 50 Special was proposed to the new generation with stylish changes to the handlebar as well as to the front and rear lights, suggesting colour contrasts which give it a “pleasantly modern” aspect, as a brochure of those years said. 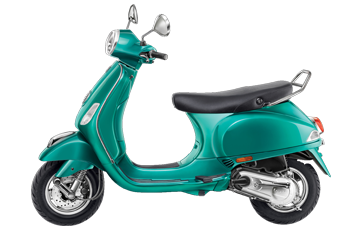 The same year sees the launch of the Vespa 50 Elestart too, featuring the same design as the 50 Special, but with an innovative technical solution: the electric start. From 1969 to 1973 one of the most famous Piaggio advertising campaign with the pay-off “Chi Vespa mangia le mele” accompanies the Vespa 50 Special’s success. 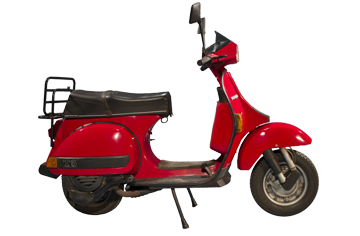 Produced for the foreign markets, the Vespa 125 ET3 has the same characteristics as the Italian ET3 (1976), except for some details such as the saddle, the cooling fan cover and the colour range. It was particularly appreciated in Japan, where it was sold until the mid-1990s. 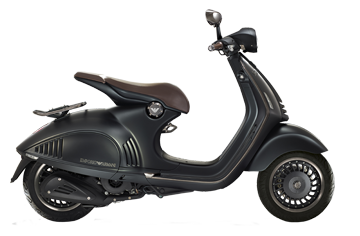 The Vespa Primavera ET3 is a specific, limited-edition variant (144,000 units were produced overall) of the Vespa “Primavera”. The initials ET3 indicate that the vehicle had electronic ignition and that the engine’s single cylinder had a third transfer port. 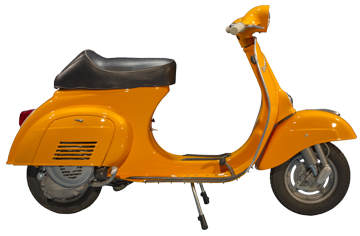 The smaller-sized body, like that of the Vespa 50cc, gave the vehicle more manoeuvrability, a feature that made this Vespa the favourite of 1970s youngsters. 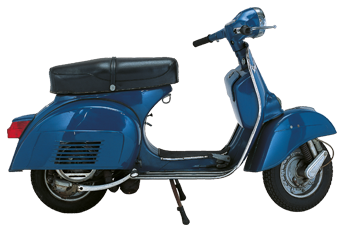 The seat the colour of blue jeans of the first few units produced reveals the link between the young and the Primavera ET3. 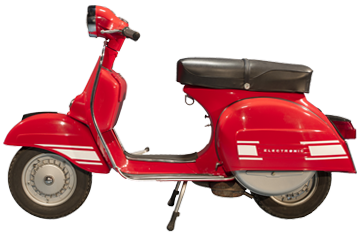 The 125cc ET3’s engine resembled the Primavera’s from the outside but was much faster and more powerful (7 bhp), so that for a long time it was the speediest Vespa of its category. Compared to previous models, the PK stood out for its new body, characterised by decidedly more angular lines but also by increased riding comfort. 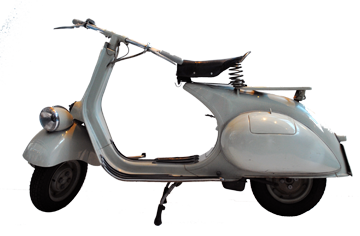 The S Automatica version was one of the most innovative projects of the period, the first ever Vespa with automatic transmission. Compared to the PK with manual transmission, the main difference was the completely new engine, but there was a visual difference too in the shape of the scooter, evident below the right panel. The ETS was a sports version of the 125 PK series, as the ET3 had been of the Primavera. Aesthetically, its distinguishing features were the new, more compact handlebars, the saddle with a hint of a tail and the screen-printed wording, the black and silver decorations on the front mudguard and on the shells. The fan cover was black, the glove compartment behind the shield was rounded and larger, the exhaust was elongated. Furthermore, the handlebar cowl was narrower and pointed, which required the horn to be moved to the side, in the shield. With regard to the mechanics, the engine shaft was strengthened, the inlet enlarged; the aspiration duct and the carburettor were also improved. The braking was improved too, thanks to the new floating cams and the anti-sinking device of the front suspension. 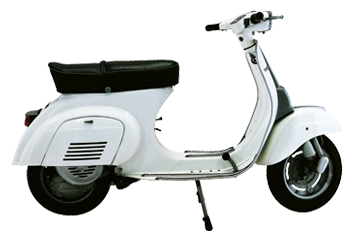 A new name and renewed aesthetics characterised the Vespa 125 T5 “Pole Position” launched in 1985. The aggressive lines, the spoiler, the windshield and the digital tachometer enhanced its sporty character. 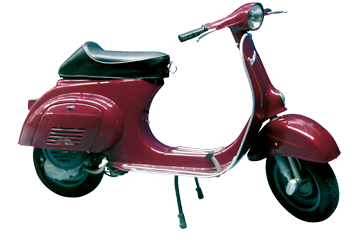 Piaggio entrusted the difficult task of facing off the fiercely roaring Japanese competition to this model. The T5 had a new five-port engine delivering a performance level never achieved by any other Vespa model with similar displacement. This scooter’s connection with the motor-racing world was sealed, in addition to the name, by the choice of Formula One driver Nelson Piquet as testimonial. 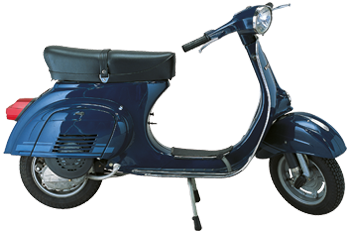 The Vespa 50 HP was produced from 1991 to 1999. 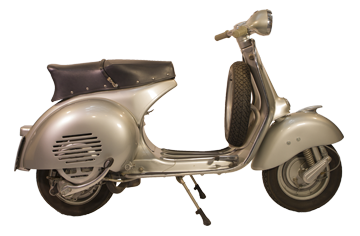 Unlike the Vespa 50’s of the past, it had numerous plastic parts, such as the mudguard, the under-saddle piping and the rear cowl. The aluminium heating unit came as standard, as well as a slightly larger carburettor (from 16:10 to 16:12, as other PK versions). It also had a starter motor, already previously introduced with the N and FL2 models and 4 WHP (wheel horsepower). Also standard was the racing crankshaft and lightest flywheel ever produced, weighing only 1.35 kg. 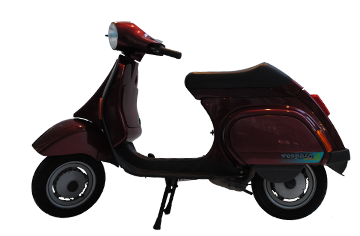 It was the Vespa of the youth of the 90’s; however, it marked the end of production of the Vespa 50 with manual transmission since it was unable to meet the Euro 1 anti-pollution regulations. 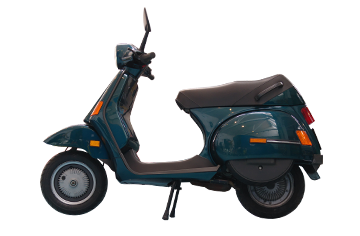 In 1999 it was replaced by the Vespa ET2, a completely new model with continuously variable transmission and engine with modern design. The model exhibited in the Museum is on kind loan from Giuseppe Stefanelli. 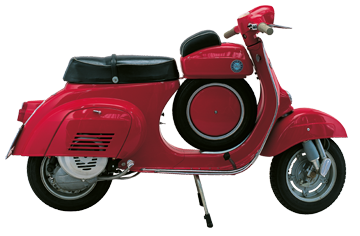 A limited edition for the Vespa 60th anniversary celebrations, of which just 999 specimens were produced. This was an extremely refined “vintage” version. 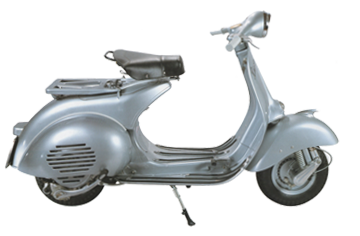 The aesthetics were a tribute to the first Vespa models, characterised by the headlamp on the mudguard. The handlebars were also retro, inspired by the tubular structure of the period. The instrumentation had a circular shape with graphics perfectly in line with the past. The black saddle was divided into two sections, one for the rider and one for the passenger, as in the 1950s. The model displayed here is serial no. 000. The Catalyzed version of the legendary PX was launched in the late 1990s, in compliance with the new emission regulations. Equipped with a two-way oxidation catalyst to meet the Euro1 emissions standard, this model also had a number of aesthetic innovations: a new saddle shape, white plastic for the direction indicators and a black fan cover. The second series also had new handlebar instrumentation incorporating the speedometer, fuel level indicator and warning lights. The headlamp was halogen. On the shield, the original Piaggio logo returned. Continually updated, the PX maintained its popularity with the public. reductions in exhaust and acoustic emissions, the engine’s exceptionally low fuel consumption levels are among the best in the world, with a capacity of more than 60 km per liter of fuel.